Basewall Strapping: 3/16" x 1.5" x 24" Steel Flatbar with 1/4 " Bolts & nuts ea. 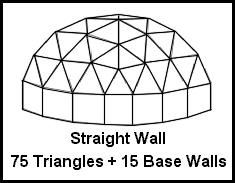 Roof with shingles or other material-not included in kit. 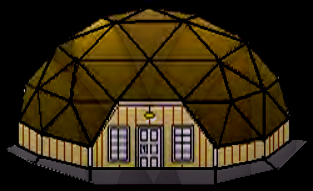 The 35' dome was designed to be a light weight shell built from stud length white pine material for a 2 bedroom rental that is cost effective. The simplicity of the design make it easy and fast to assemble and finish. The upstairs area has a short wall which leaves the room open to the ground floor. You can close in the wall if you wish. A bath can be installed upstairs but is not mandantory. 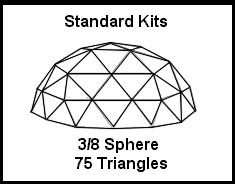 Designed to have full amenities necessary for a successful lifestyle, the 35' dome is a good choice for many applications other than a rental. A simple symetrical 2 door system is employed to keep costs to a minimum. The plans will include a window for the kitchen and lower bedroom that can be fabricated from available material. 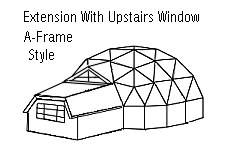 If a customer request I can build these windows for you at an additional cost. By 2002 we should offer thermal pane opening or stationary windows for the kits at a low price. Although the triangles are light weight the kit should be assembled by 4 people or with a lift assistance such as a crane , boom or ginpole. 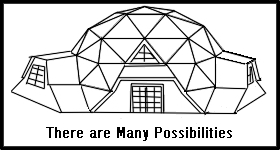 The dome will last indefinately if kept properly maintained as decades go by. Masonary exterior base walls are suggested if an iron clad rental investment is to be achieved. The kit comes with the triangles, door openings and overhangs for the door openings. Also included is a 3' base wall set with bolts and steel straps. I pre-assemble if necessary to assure a problem free kit on the construction site. Interior walls or stairs are not included with a kit. 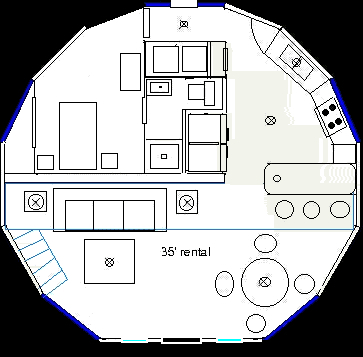 You can build to the floor plan included or design one of your own.The diameter can be increased to 37' if specified with no cost increase. 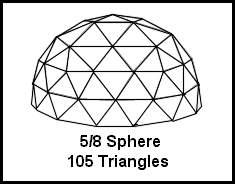 You can now get the builders secrets of overlayed strut bolt together panel 3 frequency geodesic domes in this booklet"Building Geodesic Domes"! 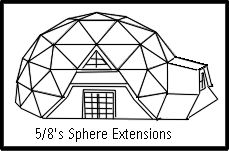 Includes correction factor formula, interpolated radius formula for 3/8 or 5/8 sphere foundation layout,shop worksheet,angles,chord factors,paper model instructions,foundation methods, shop procedure and much more.You won't find this information anywhere else on Earth! Hundreds of copies sold. 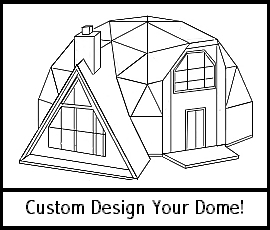 You can actually design and build domes with this manual.14pp-13 Drawings $12.00 ea.